The King James Bible Online (kingjamesbibleonline.org) analyzes monthly searches within its website and discovered that 10,901 unique users searched for the word “Jesus” in June 2014! This word was searched 8 times more than the second most popular searched term, which was “love” at 1,363 searches. The search data recorded was one unique IP address per search word, making it more accurate and reduces the likeliness of double counting the same person repeating the search within the same monthly period. Author King James BiblePosted on July 3, 2014 Categories King James Bible, UncategorizedTags Bible, Jesus, keywords, list, search, statistics, top 20Leave a comment on 10,000 Searches for Jesus! In January 2013, visitors to the kingjamesbibleonline.org website searched specific words in the King James Bible 288,908 times. All of these words were recorded and aggregated to show the most popular words that visitors searched. What Do Christians Really Believe About Christmas? With the hype, commercialism, and pagan roots of Christmas, it’s natural to question what Christians really believe about Christmas. A group of 110,000 or more Bible readers were offered the opportunity to contribute in four polls about Christmas, and below are the results. 25 Percent of Christians do not believe in celebrating Christmas. 83 Percent of Christians do not believe December 25 is when Jesus Christ was born. 64 Percent of Christians are not OK with letting kids believe in Santa Claus. 39 Percent of Christians are not OK with having a Christmas tree in a church building. This report summarizes four separate polls about Christmas, conducted in December 2012 from is King James Bible Facebook page. 134 people answered among 1,277 who saw the post. Asked on December 21, 2012. Most Bible-reading Christians say ‘Yes’, Christians should celebrate Christmas. Nearly three times as many Bible-reading Christians say they should celebrate Christmas than those who do not. However, it is significant that 1/4 of Bible-reading Christians indicating that Christians should not celebrate Christmas. Do you believe December 25th is the true day that Jesus Christ was born? 251 people answered among 4,440 who saw the post. Asked on December 7, 2012. A vast majority of Bible-readers do not believe December 25th is the true birthday of Jesus, but many are still in support of celebrating it. Nearly 7 times more of the Bible readers believe December 25th is not Jesus Christ’s birthday than those who do. OK to let kids believe in Santa Claus? The results show extreme opinions with few responses in between. More than twice as many Bible readers believe that it is ‘definitely’ not OK to let kids believe in Santa Claus. However, it is also significant that one third of Bible readers think it’s OK to let kids believe in Santa Claus. 189 people answered among 3,114 who saw the post. Asked on December 20, 2012. OK to have a Christmas tree in church building? Christians are divided on this issue. Christmas trees in church sanctuaries and lobbies seem to be a common occurrence during the Christmas holiday season and this poll indicates that 39 percent disagree with having them there. 186 people answered among 2,249 who saw the post. Asked on December 21, 2012. These four polls were conducted in December 2012, using the King James Bible Facebook page. The most interesting statistics are listed at the top of the page in red. While the poll data shows differences of opinion about Christmas, the comments pointed to a unifying belief in celebrating Jesus Christ, which represents salvation, forgiveness, and hope of eternal life. 100% have ‘liked’ the King James Bible Facebook Page. Mostly scriptures are posted to the page. We can presume the users are Bible readers. 79% reported having read the entire Bible at least once. 65% live in the United States. For more information, please contact the King James Bible Online. Author King James BiblePosted on December 21, 2012 Categories King James Bible, UncategorizedTags believe, Bible, birthday, building, celebrate, Christ, Christians, Christmas, church, December 25, interpretation, Jesus, Jesus Christ, king james bible, kjv, poll, questions, readers, report, results, Santa Claus, survey, tree, xmas14 Comments on What Do Christians Really Believe About Christmas? 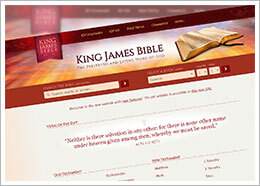 King James Bible Online (www.kingjamesbibleonline.org), a website inviting its visitors to read the Bible online, celebrates surpassing 1 million visits in the month of October 2012. Google Analytics statistics reports 11 million total visits and 6.3 million unique people have visited the website since its start nearly five years ago on November 11, 2007. Its users have found a variety of the features useful, including the Bible trivia, upgraded search function, and statistics, such as the most popular Bible words. A CNN blogger recently cited the King James Bible Online as an “amazing website” in his article while suggesting that the quantity of a given word in the Bible correlates to its level of importance. “While we’re pleased the word popularity data is useful, the King James Bible Online does not fully support the logic that the more a particular English word is used in the Bible, the more important it is,” said Trent Mueller, manager of the website. More user feedback on the website can be viewed on its ‘encouraging words’ page: http://www.kingjamesbibleonline.org/Encouraging-Words/. LONGVIEW, Wash. – Referred to as the best-selling book of all time, the King James Bible, after 400 years, maintains a strong following of readers, with online readership on the rise. This month, as people around the world celebrated the 400-year anniversary of the King James Bible, through conferences and special media coverage, more people than ever before are searching the web for the King James Bible. According to Google Insights, a service that compares search volume patterns, the phrase “King James Bible” was searched 9 percent more this year compared to the previous seven-year average. That specific phrase was searched an average of 246,000 times across Google’s global websites, according to Google’s AdWords Keyword Tool. Other keyword phrases that included either “King James Bible” or “King James Version” were searched more than 2 million times per month. LONGVIEW, Wash. – In a poll conducted on May 16th, visitors to the King James Bible Online (kingjamesbibleonline.org) website and Facebook page were asked, “When do you think Judgment Day is?” The three choices offered were: “May 21, 2011”, “December 21, 2012”, or “No one knows, but God.” Of the 179 respondents, 176, or approximately 98 percent, marked “No one knows, but God.” Three respondents, or approximately 2 percent, chose May 21, 2011 as Judgment Day. No respondents chose December 21, 2012.